Motion Compensation - Detail Design Inc.
Air-over-oil constant-tensioning systems are used throughout the offshore industry to maintain tension on risers and guidelines. Tensioners work on the air spring principle. This unit was custom-designed to tension a small diameter drill string being deployed from a work boat. 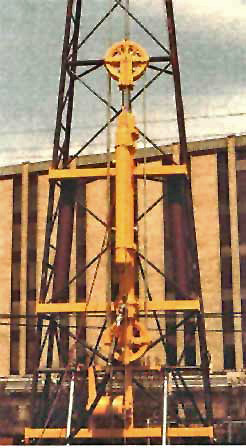 The system applied a variable tension up to 20,000-lbs on the hook. Not shown is a suite of standard gas bottles which were manifolded together to create the system reservoir. Safety features of the high pressure air system include safety wires inside large diameter pneumatic hoses, excess flow velocity shut-offs, and the use of water-based lubricating fluids. The system was configured for easy air freight shipping.